Michael Stevantoni and Annabelle Foss celebrate their gold win with PRDFS director Tony Papa in Toronto in June 2014. Two students at Powell River Digital Film School (PRDFS) recently won a Canada-wide competition, thanks to their outstanding short film created at a Skills Canada competition. Before creating their film, Michael and Annabelle received a theme to be used as their subject. They were asked: “Everything you post on social media impacts your personal brand. How do you want to be remembered?” They had six hours to complete a two- to three-minute film. 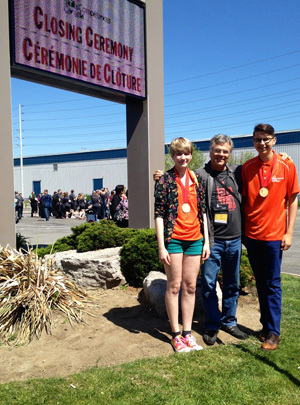 Before their win in Toronto, Michael and Annabelle won gold in the provincials. Earlier in the year, four students from PRDFS were paired at the regionals, held online,winning gold and silver. This latest award continues a tradition of student success at Powell River Digital Film School, which is in its seventh year. Its students have won awards at both the local and international level and some have had their films screened around the world.